In Oakland’s Chinatown, Michael Tran has been talking to young people in the Asian community about the importance of healthcare – a complex topic in which they aren’t readily interested. “Folks in our community, they’re not totally engaged in the process. There are a lot of cultural barriers and many of them work long hours. They also don’t want to draw a lot of attention to themselves,” said Michael Tran, a program coordinator at The Spot, a multi-service center that promotes health of young Asian Pacific Islanders through the Chinatown Youth Center Initiative. With less than a month before Californians can buy subsidized health insurance through Covered California, the state’s online marketplace mandated by federal health care reform, Oakland healthcare organizations are targeting both the Asian and Hispanic communities to get uninsured people on board. 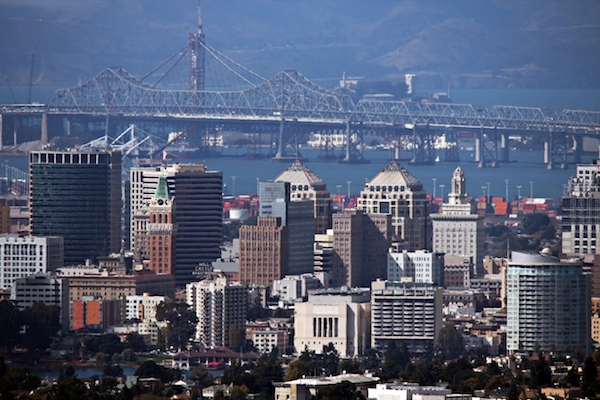 Combined, these two communities make up nearly 60% of Alameda County’s uninsured population. The Uninsured in Alameda County, 2011. Permissions Alameda Health Consortium. Throughout Alameda County, 192,472, or 12.8% of the county’s population, are living without health insurance. In Oakland, there are 68,535 people, or 17.6% of the city’s population, living without health insurance. Outreach efforts targeted to specific communities are based on need, Santiago Lucero, spokesperson for Covered California, said. While African Americans make up a smaller percentage of uninsured people living in Alameda, organizations that predominantly serve African American communities are also involved in outreach. “The majority of our population is African American…We don’t target any specific ethnic group, that’s just because of the neighborhood that we’re in,” John Holman, spokesperson for the non-profit health clinic Healthy Oakland, said. “We’re targeting those people who make just enough to not qualify for any subsidized benefits but not enough to actually pay for their own (insurance),” Holman said. “It has to do with affordability,” said Sherilyn Tran, Director of The Spot, said. But when it comes to enrolling in subsidized healthcare through the online exchange, culture is key. “A lot of South East Asians have a historic distrust of the government. Many of them are refugees – they have come from countries where the government was killing its own people,” Michael said. Part of building that initial trust, Michael said, means speaking to people in their native language. “My Vietnamese is not that good but if you have that cultural connection, people are more willing to listen,” Tran said. Through a series of grants, Covered California has funded outreach efforts in Oakland that are powered by local organizations like The Spot, which boasts local roots as well as bi-lingual and culturally sensitive staff. To complement their multi-lingual skills, hordes of staff members have attended Covered California’s certified trainings to learn how to navigate the complexities of the healthcare exchange to best match community members with a health plan for which they may not even realize they qualify. East Bay Agency for Children (EBAC) has eight health outreach programs throughout Oakland. They received Covered California funding to set up booths outside local storefronts, pass out pamphlets, host workshops and attend a series of community events where their multi-lingual staff can promote Covered California enrollment to Spanish and Hmong speakers. “We’re really trying to reach families where they’re at, so it’s important to take a culturally sensitive approach to reaching them,” Julie West, Development Director for EBAC, said. EBAC has sent six of its staff to certified Covered California trainings. Some organizations have gotten a head start by pre-determining whether some of the people they serve are eligible to buy insurance through the health exchange and queuing them up for enrollment. “Asian Health Services (in Oakland) already has a lot of people who are eligible,” Doreena Wong, Project Director of Asian Americans Advancing Justice’s Health Access Project, said. Asian Health Services received independent funding for its outreach efforts, but AAAJ received funds through Covered California, which it distributed to organizations like the Korean Community Center of the East Bay, which partners with Asian Health Services. Together, the organizations work with churches, staff community events, and host regular workshops to educate its members about enrollment options. I am looking for training locations I am licensed and approved as an agent and cannot get through the website. Please help.